This was something else that I built for my granddaughter. This was really a fun project and I tried something new with the finishing of this horse. I am not sure what it is called (I am sure it has a name) but after it was assembled I took a blow torch to it and burnt all of the soft grain in the wood, then sanded it down and applied a water base stain. I think it turned out rather nice, and the granddaughter loves it. Another Nice Piece of work for the “Kiddies’! No Doubt She’ll Love It!! 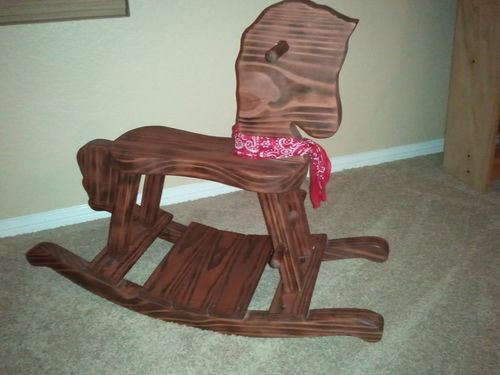 Pretty and hefty rocking horse that I’m sure she enjoys. Way to go Grand Pa!